It’s the time of the year when acorns are falling out of the oak trees and onto the ground. Acorns contain a complete protein so they are a valuable edible resource. The acorns to look for have already separated from their cap, have no holes, and are solid in color, usually medium to dark brown. White oak acorns germinate in the Autumn season so they have a short collection period whereas black oak acorns don’t germinate until the next Spring so that it has a longer collection season. To prepare for shelling it’s best to spread them out on a tray for drying. If using the sun it may take a few days while covering them at night to keep off the dew. This can also be done in an oven at it’s lowest temperature for several hours. White oak acorns take longer to dry than black oak acorns. Drying acorns helps to separate the nut inside from it’s outer shell and makes the shelling process easier. 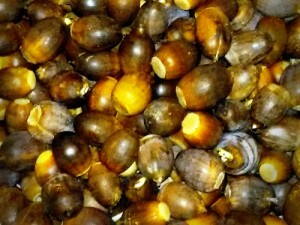 Acorns contain tannic and gallic acids that are toxic and are counter nutritional and causes to acorns to be bitter so they must be removed by soaking in water to leach them out. 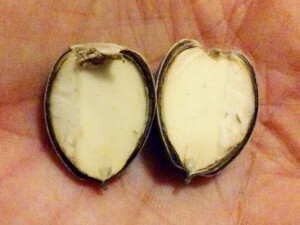 To start this process the acorn must be shelled and can be opened different ways. They can be slit open by using a hand pruning shear or set on a rock with the head end down and the pointed end up, then lightly strike it with a rock just hard enough to crack the outer shell. Acorns can be ground either the traditional way with a rock or by using a food processor. The finer the particles the better for more efficient leaching. Once the acorn nut has been ground it is placed in a cloth and soaked in water for a few days that is changed a few times each day. Some folks prefer to boil them with a couple changes of water but the cold water method is more effective at reducing bitterness. You can occasionally taste the acorn meal for bitterness/blandness to determine when the leaching process is complete, then it can be dried and re-ground finer if desired. 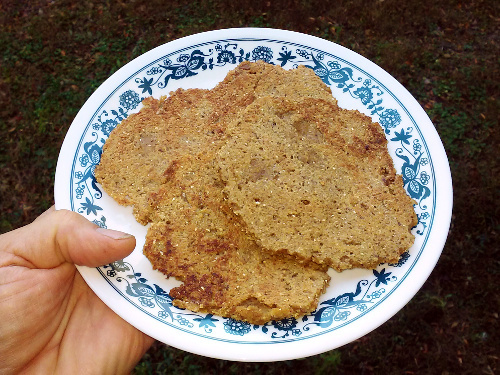 I prefer to combine acorn meal 50/50 with corn meal with which to make paddies or flat cakes. A common recipe is to take 1 cup of acorn meal, 1 cup of corn meal, 1/4 cup honey, 1T melted butter or oil and add a pinch of salt. Add just enough water to make a medium paste. Although some people like to make patties by hand, I have had more success with taking a spoon full of the dough, placing it on the cooking surface, and using the spoon to smooth it out until it’s flat and round, much like you would spread tomato sauce on pizza dough. To cook you can use an ungreased pan on the stove or a heated rock over coals. The patty will take a few minutes to cook. Watch the outer edges for cracking then lift an edge to check for doness then flip it over to cook the other side. The goal is to have a slightly browned cake when done. When I first made acorn cakes as a homeschool project with my sons I was amazed at how substantial they were, very satisfying and quite a treat. The process takes time with some effort but is a rewarding experience and very nutritional. This entry was tagged Acorn, Cook, Edible, Leach. Bookmark the permalink.